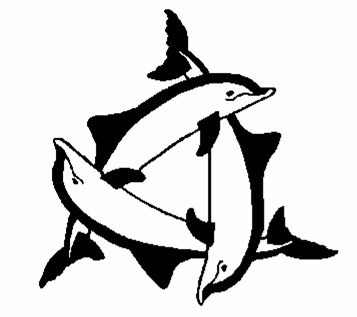 Trinity Center is an oceanfront camp and conference center located on the Southern Outer Banks of North Carolina. Whether you need to find a place to retreat and refresh your staff, train new employees, or to plan your year . . . we offer a serene and homelike atmosphere away from everyday distractions. We hope you will come and enjoy the services of a staff that is warm, professional, and ready to serve your every need. 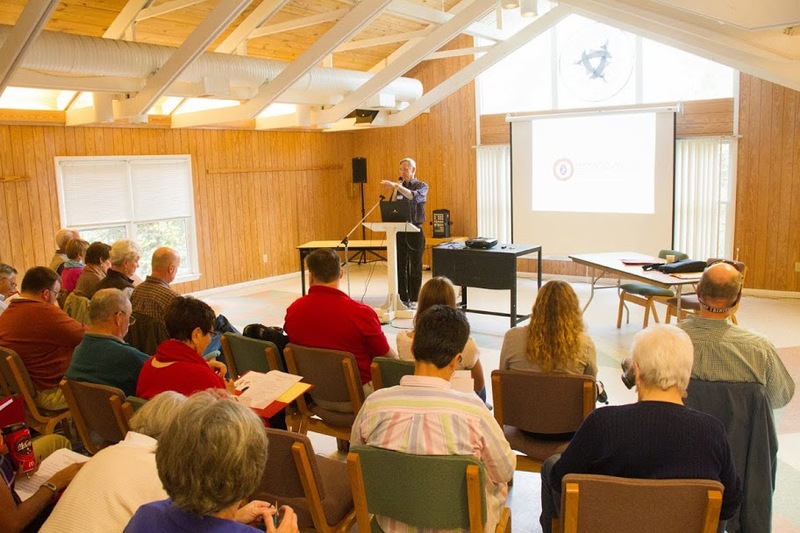 Trinity Center regularly hosts all types of retreats and conferences. We are a non-profit enterprise welcoming groups from all faiths and denominations, civic and non-profit organizations, health & wellness workshops, family events, and commercial interests. Our conferencing and meeting spaces are designed to support the needs of various size groups, up to 225 people. Meeting requirements are supported by a variety of seating and table configurations, as well as numerous audio-visual equipment options. All spaces are smoke-free, climate controlled and located within easy walking distance from one another. The comfort and convenience of the meeting space interiors are complemented by attached decking and picturesque views that can be enjoyed while sitting in one of our many rocking chairs. Trinity Center provides a variety of modern facilities and comfortable accommodations to meet the needs and desires of conference groups, youth camps and programs, religious or spiritual retreats and family reunions. Regular guests include yoga retreats, health practitioners, artists, writers, dancers, musicians and crafters such as quilters, rug hookers, weavers and scrapbookers! Our 62 acres spans from Bogue Sound to the Atlantic ocean and offer spacious or intimate meeting spaces, guestrooms, dining facilities, dormitories, private beach access and pavilion, swimming pools, indoor and outdoor chapels, sound-side docks, outdoor activity and ball courts, numerous walking trails over dunes and through salt marshes, glimpses of wildlife or flora and fauna of the maritime forest and fresh water lagoon…we even have Bogue Banks’ only tunnel and our own private little island for meditation! Trinity Center’s 44 guestrooms have been carefully constructed within the natural beauty and tranquility of the maritime forest. Our rooms are divided into 4 housing clusters. Each cluster is supported by its own central living room which contains comfortable furniture and gas fireplace, small kitchenettes with microwave, coffee maker and ice machine, television, WiFi and telephone access. Each guestroom has a private bath; double and is temperature controlled for year round comfort. Trinity Center also has four dormitories available for part of the year. Each dorm is sub-divided into 2 large sleeping cabins which includes a bathroom, screened porch and private center room for counselors or chaperons. Youth and school groups typically use these spaces; however, they are available for any organization. Our dining facility is open 7 days a week and offers 3 meals a day. We have the capacity to host gatherings of 225 people at one sitting and offer a variety of fixed menus. Serving options are based on the size of the group and include either buffet, plated or family style. 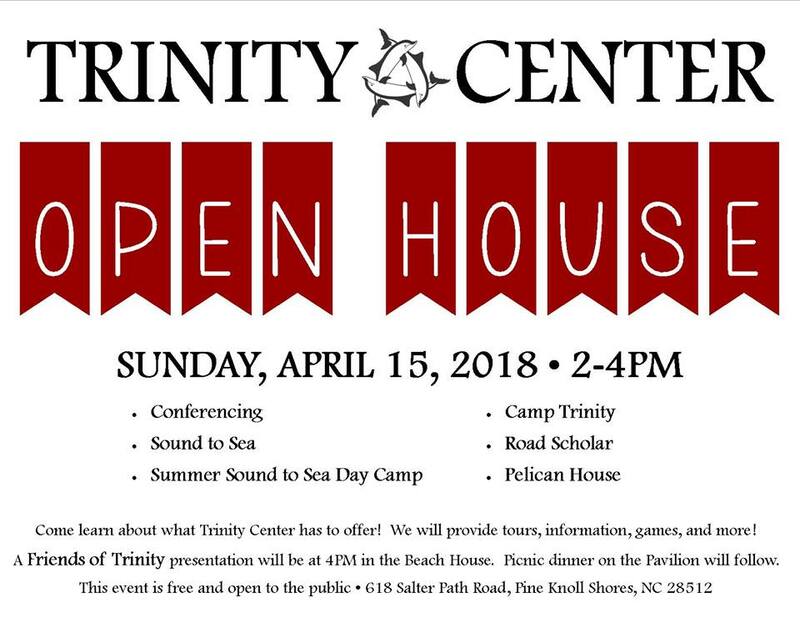 Trinity Center can also prepare a cookout style meal or a down east seafood picnic that groups can enjoy on our pavilion that overlooks the Atlantic Ocean. Our Food Services staff is adept in providing for a variety of special dietary needs or restrictions. Breakfast is a buffet of hot breakfast entrees with a cold selection of cereals, fruits, and yogurts. For other meals, diners will enjoy anything as simple as a build-your-own sandwich, soup and salad bar lunch to a full service pot roast dinner with an assortment of sides, full salad bar and delectable desert. If you need tranquility, our acreage offers plenty of hidden nooks or prayer gardens for mediation and quiet moments alone. We also offer outdoor and indoor chapels for groups or individual guests that desire a formal setting of spiritual worship,. Gather in the evening at one of our comfortable campfire rings with the fire already prepared for you to enjoy as long as you like! Please come and enjoy the facilities and accommodations at Trinity Center. Whether your group size is large or small, your conferencing needs extensive or minor, we guarantee a setting that is sure to support your requirements. If you are interested in exploring options for a retreat at Trinity Center, please fill out the form below or call us and speak to our Group Coordinator. We are hoping you will come to visit! Trinity Center is open to the public for individual reservations.